When you’re using a map app to find your way around, or if you want to check in to a location on Facebook to tell your friends where you have been; then location tracking is useful and seems benign. But apps and services can keep tracking your every move, and this can be a serious privacy issue. And aside from everything else, this also uses up your battery a lot faster than is ideal. If you don’t want companies to track you, read this guide and disable location tracking on your devices when you don’t need it. You may not know it but Google tracks your location history unless you disable it yourself. It gathers this data from your usage of Google Maps. 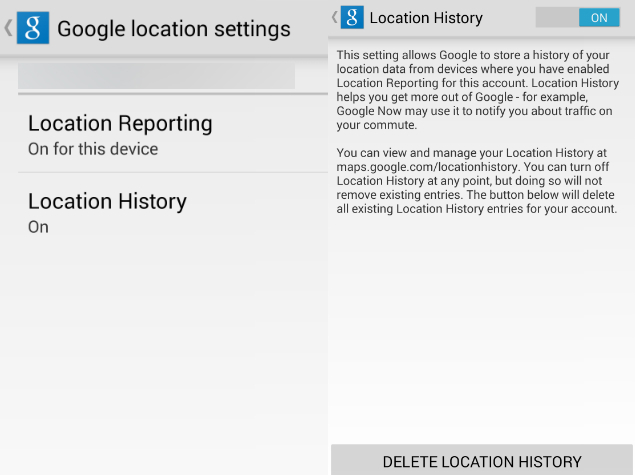 You can disable this, and even manually delete certain places from your location history. Here’s how. 1. Go to this Google settings page. 2. Click the Pause button in the “Places you’ve been” tile on the right. To delete individual entries from location history, click Manage history. 3. You can pick any date from the calendar on the left > click Delete all history from this day. If you don’t want any of your location history tracked, just click Delete all history. Turning off location settings on your Android phone is pretty easy, but it can affect the functioning of some useful services. Google Now for example relies on location data to provide you information you need without you even searching for it. If you still feel that you’d rather not report your location to Google, follow these steps. 1. Open Settings > scroll down to Location > Google Location Settings. 2. Now tap Location reporting > Off. 3. Go back, tap Location history > Off. You may also want to tap the “Delete location history” button below. Several apps and system services use your location on iOS to provide features such as apps popular in your locality and even to serve advertisements based on the place you are in. Here’s how to disable all of that. 1. Open Settings > Privacy > Location Services. 2. The first option is to turn Location Services on or off. You can turn it off to disable tracking entirely, but that will mean that you will have to do several things, such as search for weather data, manually. 3. Scroll down to see which apps have access to location data. You can decide which apps don’t need it and turn it off for that app. If you have Find My iPhone/ iPad enabled, we suggest you don’t disable location tracking for that because it may help you locate your device if you lose it. 4. Scroll down to the bottom and tap System Services. Here you can disable all options except Cell Network Search to stop tracking. Tap Frequent Locations and turn that off too. Disabling location tracking on Windows 8 is quite simple. This is how you do it. 1. Hit Windows key+C > click Search > type PC Settings in the search bar > click PC Settings. 2. Go to Privacy > Location > Let Windows and apps use my location > Off. The BB10 operating system makes it easy to prevent tracking. Just follow these steps. 1. Open Settings > scroll down to Location Services > turn off Traffic Data Collection and Location-based adverts. You may turn off Location Services entirely in the same place. 2. If you just want to disable location access by specific apps, go to Settings > App Manager > tap “Go to the Application Permissions screen to change permissions for individual apps”. 3. Now tap Permissions > select Location > tap any app that you want to cut off from using your location > Off. That should have helped you disable location tracking on any device. If there’s any other way to disable location tracking that you prefer, let us know with a comment. As always, our How to section (http://gadgets.ndtv.com/how-to/features) will help you find more useful articles. 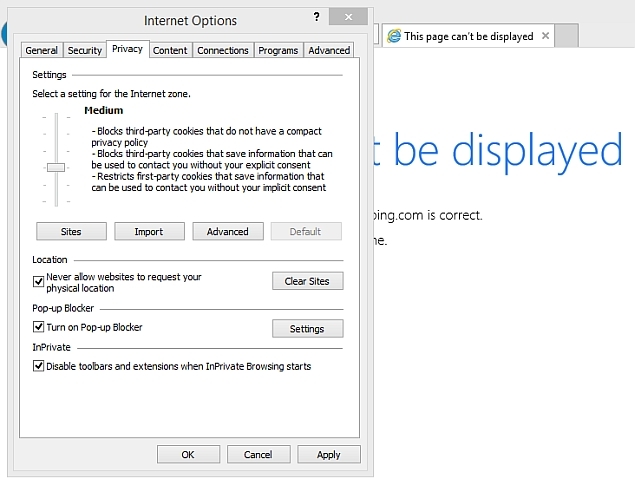 If you use a desktop or laptop to browse the Internet, you can disable location sharing in your Web browsers. Note that websites may still be able to identify your location using your IP address, but they will find it much harder to zero in on the place you’re browsing from. Here’s how you can disable it. 1. Click the Google Chrome Menu icon (three horizontal lines) > Settings. Content Settings 3. 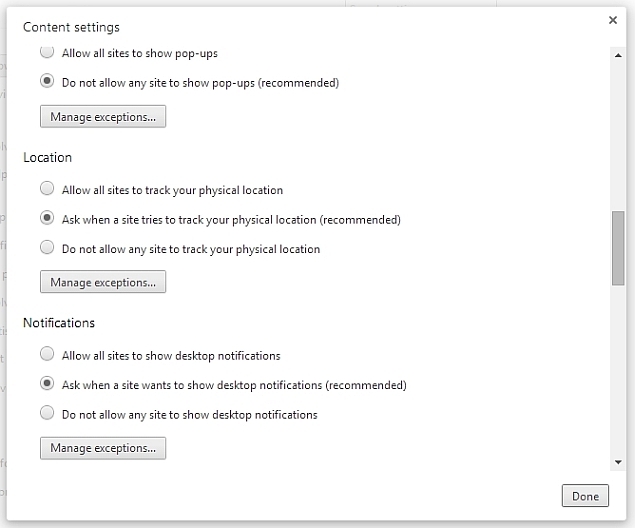 In the pop-up, scroll down to the Location section > Do not allow any site to track your physical location. 1. Type about:config in the address bar > hit Enter > click I’ll be careful, I promise. 2. Search for geo.enabled and double-click it to change its value from ‘true’ to ‘false’. This will disable location sharing. 1. Click the Opera button on the top-left > Settings. Alternatively, you may use the Alt+P keyboard shortcut. 2. Click Websites on the left sidebar > scroll down to Location > select Do not allow any site to track my physical location. 1. Open Safari > Preferences > Privacy. 2. Click Deny without prompting. 1. Go to Tools > Internet Options, or use Alt+X. 2. 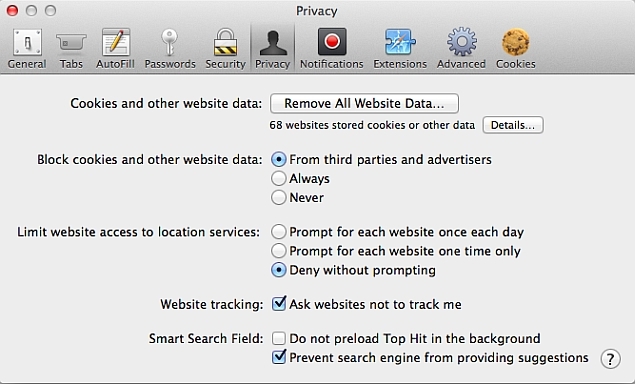 Click Privacy > check Never allow websites to use your physical location. There isn’t one place where you can easily disable specific background tracking without disabling location services entirely in Windows Phone. 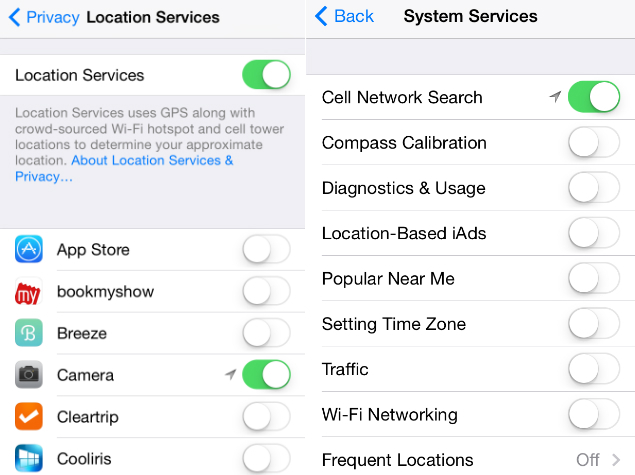 Here’s what you can do if you don’t want to turn off location services. 1. Head to Settings > swipe right to Applications. 2. Manually open each app here and disable location wherever it is an option. 3. Swipe left (back to System) > WiFi > Advanced > uncheck Send information about WiFi connections to help discover nearby WiFi. 4. Head back to System > Feedback > Off. You can also go to Settings > Find My Phone > Off but that is a useful anti-theft feature that you may not want to turn off. For a more thorough option, open Settings > Location > Off. This entry was tagged google location, google privacy, Tracking Your Location. Bookmark the permalink.